For any major initiative to succeed, it requires support from within its community as well as its surrounding environment. 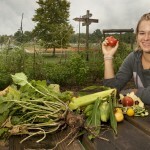 Truman State University is committed to engaging the campus community in sustainability efforts and knowledge, while simultaneously reaching out and engaging the surrounding Kirksville area. Through the meeting of these two spheres we hope to foster enthusiasm, ideas, efforts, and teachings. On Campus: Through a variety of student organizations, administrative policies, staff development, and publications, Truman State focuses on engaging our campus community with sustainability topics. We hope this web of information, services, programs, and organizations will help instill sustainability principles within our students, staff and faculty. In the Community: The sustainability movement is totally dependent on the relationship between knowledge and experience. Truman State University actively engages in this practice through public collaboration with the Kirksville community and beyond, through partnerships, coalitions, service opportunities, and stakeholder agreements.